A Queensland scooterist born and bred. I had a shot on my sister's Vespa Rally one afternoon after school and I was hooked. I then proceeded to fill the garage with various Italian shopping bikes for the next few years, always one to see how far I can push things without wasting valuable beer money. 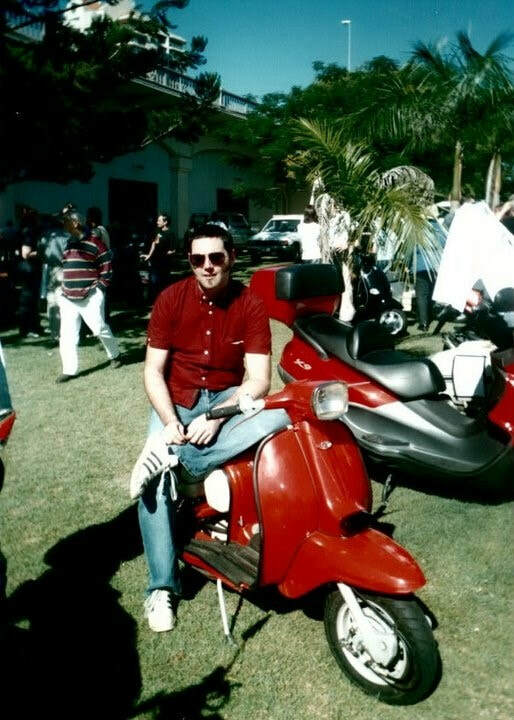 I was a member of the old QSC and founding member of the Brisbane Lambretta Club; I've always had an interest in scooters of the Italian (and Teutonic) variety. I did the antipodean two year working visa in the UK, where I worked in one of London's classic scooter shops, getting to know the scene over there. Six years ago, I shot off my big mouth about creating a 1000km road event in Australia (along with a few other like-minded nut-cases), so in typical scooterist fashion, we made our own fun and put together The Mille, which, I'm proud to say has an enthusiastic following. For its fifth year I planned the route for the Queensland event, creating what all agreed was the most challenging course yet, following all my favourite roads around Mount Warning and up to the Sunshine Coast. Together with fellow members of the Brisbane Lambretta Club I also put on last year's National Classic Scooter Rally in Brisbane. Like many others my scootering life began in the early 1980's with a Vespa 50 Special, which I rode on the second day I had a license to the 1982 Skegness rally. Three hours at 33mph. I was hooked. My Lambretta riding started as an 18 year old with a cut-down TV175, cut-down by a mate, not myself, I hasten to add, although this was the 1980s and we knew not what we did. I continued riding throughout the 80s and 90s attending rallies throughout the UK, Germany, France, Belgium, Holland and even the US. In 1999 I moved to Australia, and in a fit of temporary sanity decided that this country was too big for small wheels (although I always kept a Lambretta in the garage), and so bought myself a Triumph instead. Eight years later and the bug bit again when I picked up one of the last of the Vespa P200s for commuting. This coincided with the start of the National Classic rallies and it's fair to say I'm well and truly addicted again, with 3 Lambrettas and 2 Vespas in the garage. I've attended every National Classic Rally and participating in all six Classic Milles, as well as organising the first and latest Australian Lambretta Jamborees. I started my scootering career in the UK in the early 1990s, quickly deciding that I’d better get my own license as I didn’t like being a pillion. I’ve owned big wheels (Ducati, Triumph) and little wheels (Lambretta and Vespa) and loved them all, although my current favourite is my Series 1 Framebreather. Attending the UK scooter rallies gave me a love of road trips and I have since ridden thousands of kilometres round Europe, India and Australia. The ride across the Nullarbor to the Fremantle Australian National Classic Scooter Rally in 2011 was a particular highlight. I’ve been Canberra-based for the last 15 or so years. I think there’s an illness you catch when working in a public service town – an impulse to give back to the community. In my case, I directed my time towards the two-wheeled community. I served as Secretary of the Motorcycle Riders Association of the ACT for eight years and on the Committee of the Australian Motorcycle Council, two advocacy groups who until that point didn’t really consider scooter riders as part of the riding community. They know an awful lot more about us now! 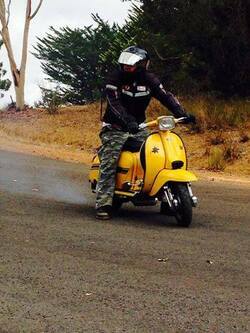 I’ve also contributed to the scooter community in Australia generally by being part of the organising group for the Australian Classic Scooter Mille, the National All-Inclusive Rally in Jindabyne NSW and the inaugural Australian Lambretta Jamboree in Canberra. As this year’s Treasurer for the LCoA I bring 20+ years’ experience as a Chartered Accountant to the role. Quantum leap a few decades of classic cars and I've followed Michael into the real McCoy, got my licence and having fun trying different scooters and how they work. Favorite so far is our S2. Love the handling!! I'm Joe, based in Darwin, so far away from most of the scene in Australia. I still manage to be a regular at the Jamboree and National Classic Rally. I own an old Indian GP200, which is getting closer to being on the road. This is my first stint on the committee and I'm looking forward to getting stuff done.